In retrospect, deciding to go and photograph Liverpool's iconic Liver Birds at rush hour, on a stormy March afternoon, wasn't my brightest idea. We weren't in the city specifically to do that. I was acting as makeshift taxi for friends wishing to visit a family member. We'd been on the north side of Liverpool all afternoon. 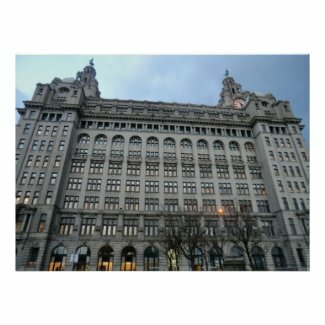 But now, on the journey back to the home of my local buddies, it occurred to me that I'd never photographed the Royal Liver Building before. Which was a bit of an oversight, as they ARE symbolic of the city and I'm there quite a lot. "Alright if I do that?" I asked, and a series of Scouse affirmations made it so. "Where's the best place to park?" "Dunno, gal. I don't drive." Which was kind of the point of me driving right now. "But it's down by the Albert Dock." So in that direction we went, staying on the main ring road towards Strand Street at a snail's pace. It was well sign-posted; though in fairness, I did have two Liverpudlians in my car to guide me, should I be desperate enough to resort to such measures. That was always a bit of a roulette between arriving at prescribed destination or submitting to being gloriously and scenically lost. Yet looking up at those signs apprised me constantly of the darkening weather. It was going to be a quick in and out of the car, should we ever get there. The rush hour wound in a throttle hold on the city streets. Traffic lights changed, then changed back, running through their sequences at least twice before we were able to make it past their uncertain glow. Yet in truth the weather wasn't too bad. At least not for March alongside the Mersey. It certainly wasn't anywhere close to the stage of aborting mission. A little cloudy, extremely cold, but the sun was occasionally attempting to beam behind the clouds. 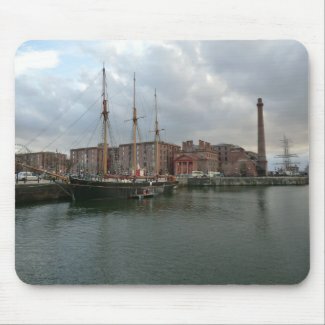 By the time we actually made it to Liverpool's Albert Dock, it looked a little like the beginning of summer. Unless, of course, we had been in that traffic jam for so long that the season had turned on us! But my Scouse friends were happy to wait in the car-park. 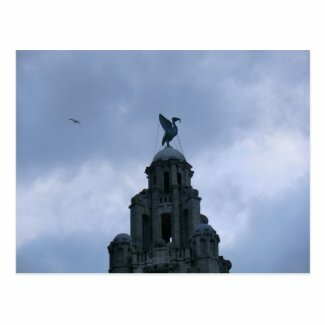 They'd more than seen the Liver Birds before and really didn't see the need to peer up at them again. Particularly since the clouds were quite so bright as I was making out. 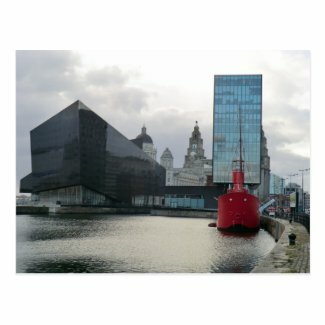 And as I began to walk around the Canning Dock, towards the Royal Liver Building, said clouds were distinctly becoming darker. Though they made for a great effect in photography. Do note that I haven't touched these up at all. They are all as I found the day and the scenery. 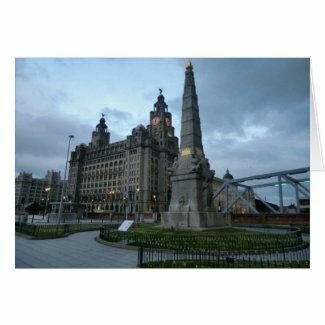 Liverpool is a beautiful city really. Liver Birds - and Royal Liver Building - duly photographed, I went wandering off around the back, towards the Mersey and its docks. I'd been distracted by a beautiful monument, its golden tip and central piece glowing strangely in the increasingly bruised light. I'd never noticed this before, tucked away as it is, beyond easy viewing for a driver on the main road. It was a Titanic Memorial column. Not dedicated to just anyone on that ship, but those heroes in the engine room - mostly Scousers, but for those brought in from Southampton - who stayed working until the bitter end on that stricken ship. They knew that they would die. Or, at least, there was a massive likelihood that they would meet their end. But nevertheless they remained below, shoveling coal into the furnaces for as long as their engine rooms were above water. There are legends of doors jamming, trapping some of the men inside too. Those poor souls couldn't have fled, even if they'd wanted to. Yet the fact that the power continued meant that they understood this, accepted it and went on working. It was important, you realize. As long as the power remained, then messages could be sent from the Marconi Room. Those famous distress signals of Mayday, Mayday and CQD, and one of the first real time maritime renderings of SOS too. As long as there was light on board the ship, then people didn't panic quite so much. There was still room for denial and the stubborn belief that they'd all be saved in the end. And when they weren't, then at least it wasn't in darkness. 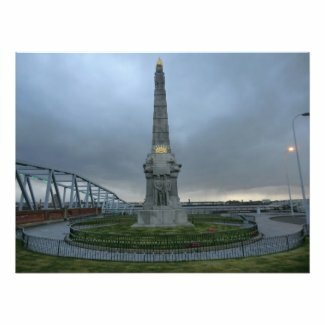 The men for whom this memorial stands, alongside the River Mersey, made sure of that. Heroes, one and all. As I walked around the docks, I could see the storm coming from the direction of the Wirral. Great swathes of desperate greys and deep darkness across the river. Yet still I took photographs, meandering about catching ships and ferries, returning time and again to the Royal Liver Building, just in case none of the previous pictures had been any good. 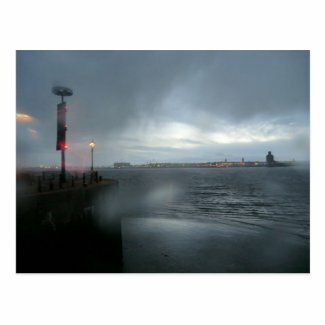 The first droplets came as I finally drifting near to the Museum of Liverpool. I covered my camera with my handbag, taking it out only when another great view caught my eye. I could see the rain coming in, yet still I stubbornly denied that it was quite as bad as it seemed. And there I learned a lesson - denial of the storm will not stop it reaching you and drenching you to the bone. But you can get some tremendous photographs in its midst. I couldn't feel my hands. By the time I wove my way through the docklands and walkways back to the car, my fingers wouldn't move. I'd long since stashed my camera into my waterproof bag, as the torrential rain plummeted down with no protection. Battering the riverside, brushing me aside in the more exposed junctures of Albert Dock. I fumbled at the car door, dived inside to where it was nice and warm, and my Scouse friends watched with bemusement. "Ger yer pictures then, gal?" "I can't feel my fingers! I'm frozen solid! Wow!" 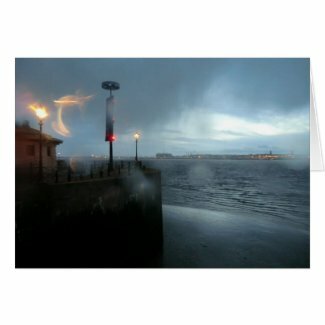 The storm was ferocious outside, sheets of rain pummeling the windows and washing water in a frenzy in the docks. And that beautiful Liverpudlian man took my hands and held them between his own cozy hot mitts, until the circulation returned in tingles and rushing heat. "Yes, I got some photos. I think I got some half decent ones too." "And storm. Over the Mersey."